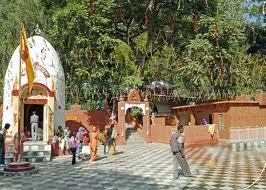 Here is Some Information about Renukaji Temple in Nahan Himachal Pradesh India. Renuka temple, dedicated to the immortal Renuka, stands near the picturesque Renuka Lake (Sirmour). 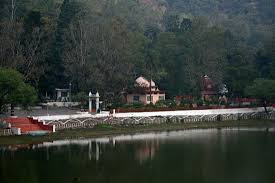 Parashurama Tal and Renuka Temple, located at the base of the Renuka Lake is the Parashurama Tal, a massive pool embodying, it is believed, Parashurama, who desired to spend eternity at his mother's feet. Mother and son are reunited every year at the great Renuka Fair, held on banks of the lake, in the month of November.The original temple of Renukaji, is said to have been built overnight by a contingent of Gurkhas in the early 19th century. Legend has it that when the evil Sahasarjuna killed the sage Jamadagini and tried to abduct his wife Renuka, She flung herself into the water. The gods restored her to life and this like is regarded to be her embodiment. There are a number of legends and stories associated with this temple. One of them states that Rishi Jamdagni disappointed with his wife asked his son Parshuram to kill her. Parshuram carried out the Rishi's orders but requested him to grant life to his mother. As per another legend, Sahasarjuna wanted to kidnap Renuka. To save herself, she jumped into this lake and the gods saved her. Since then, this lake became an embodiment of Renuka and is named after her. Tourists enjoy the beautiful landscape here along with the boating activities at the Renuka Lake. You can tour a number of shrines located along the banks on paddleboats. A zoo, close to the Renuka Lake, is home to species of Asiatic lions, deer and black bears. 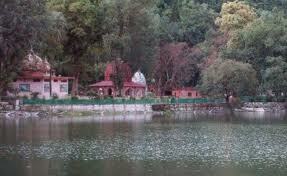 You can also visit Jataun, a hydel project dam, located 5 km from Renuka Temple. By Air:The nearest airheads are Dehra Dun and Chandigarh, which are accessible from Nahan and Renuka by road. Dehra Dun and Chandigarh are served from Delhi by Indian Airlines. Within the state, the capital Shimla is connected by air, from which the region is accessible by road. By Rail:For Nahan, the nearest railhead is Ambala, 100-km away; Dehra Dun also serves as a railhead, 65-km from Paonta Sahib. Regular train services from Delhi connect both rail terminals. By Road:Delhi is the entry point for the region. For reaching Renuka, there are two routes from Delhi, both approximately 350-km. The first route from Delhi is via Shahabad, Naraingarh, Kala Amb, and Nahan to Renuka. The second route begins in Delhi and goes via Pipli, Yamunagar to Renuka. The Distance between Nahan and Paonta is 45-km; between Nahan and Renuka is 35-Km; and between Paonta and Renuka is 58-km. Saketi is 22-km from Nahan.